Even though I have had problems and failures with my 1st-year small garden, one thing that has really grown well here in Central Florida is watermelons. I have never grown watermelons before and the 1st one I harvested, was not ripe. What a disappointment. I had waited the 78 days for maturity and when I thumped it, there was a thud like its suppose to. I wasn’t planning on wasting another melon, so I started doing some research and found out what worked. You have a small garden and you grow watermelons? Doesn’t that take up a lot of space? The answer to both those questions is, YES. My watermelon plant took up about 15 feet in length of my garden, but I planted it close to the house and let it run behind my blueberry bushes. I controlled how it spread and there wasn’t a problem at all with this smaller watermelon variety. For those new to my blog, my garden is about 25 feet long and about 6 feet wide and sits right next to my home since we don’t have much of a yard. The variety I used is called Sugar Baby and the fruit gets about the size of a bowling ball. Just perfect to sit in your fridge and not take up much room. For hubby and I, this is the perfect watermelon for us. I had 3 watermelons grow from one plant and would have had more if I had helped with the pollination of the flowers. 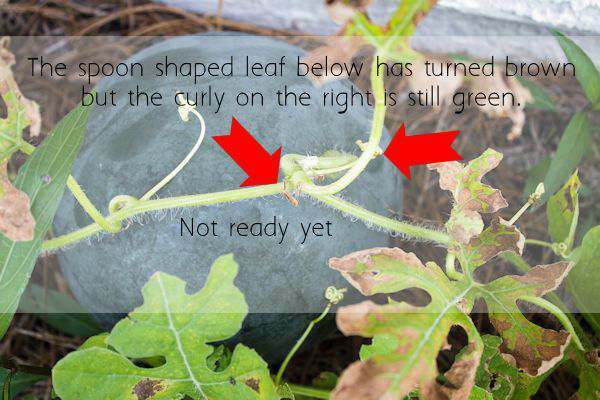 But, with this being our first year of small gardening, we were excited to see the 1st watermelon develop. There are 2 smaller ones growing now, but I don’t know if they will survive or not. 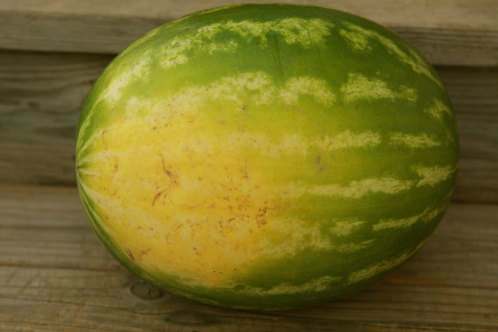 Too much rain, something we get here almost daily during summertime, can cause a good watermelon to split. Count the days – Maturity day for the Sugar Baby is 78 days from planting. I planted on April 9th, so mature date would be about the middle of July. Thump the outside of the melon – You want a dull, hollow sound. The only problem is that my melon sounded right, days ago! 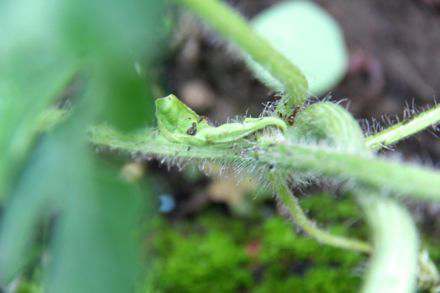 Check the curly tendril/spoons on the fruit – This test seems to be the best to determine if the fruit is ready to harvest. Firstly, check to see if your mature date is close and then start watching the signs. 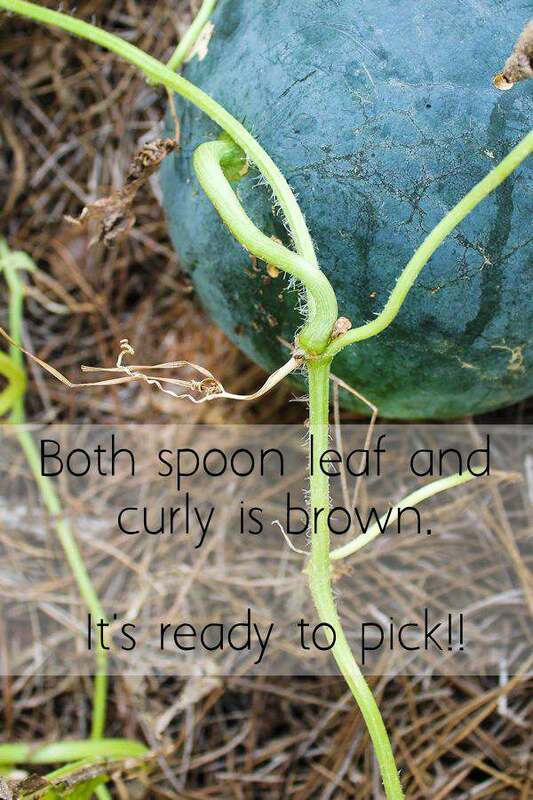 Right where the vine comes out of the watermelon, there is a spoon looking leaf and a curly tendril. As in the picture above, the spoon is still really green. Secondly, after a few more days, the spoon leaf has turned brown. But, the curly tendril is still green. Getting closer. Thirdly, after a few more days, the spoon leaf and curly tendril are both brown. It’s time! It’s time!! Another way to test to see if your watermelon is ready is to look at the bottom of the melon. The part that is laying on the ground. If its white, it’s not ready. If its yellow, its ready!! Now on to enjoying that red, sweet juiciness and put in the fridge. Watermelon contains high levels of healthy antioxidants, making Sugar Baby a great way to enjoy something sweet but be nutritious at the same time. Use a watermelon slicer for easy cutting of perfect slices to serve. I love enjoying one of my favorite fruits in the summertime. Kids will love these too because they are a perfect size for them to help harvest and carry. 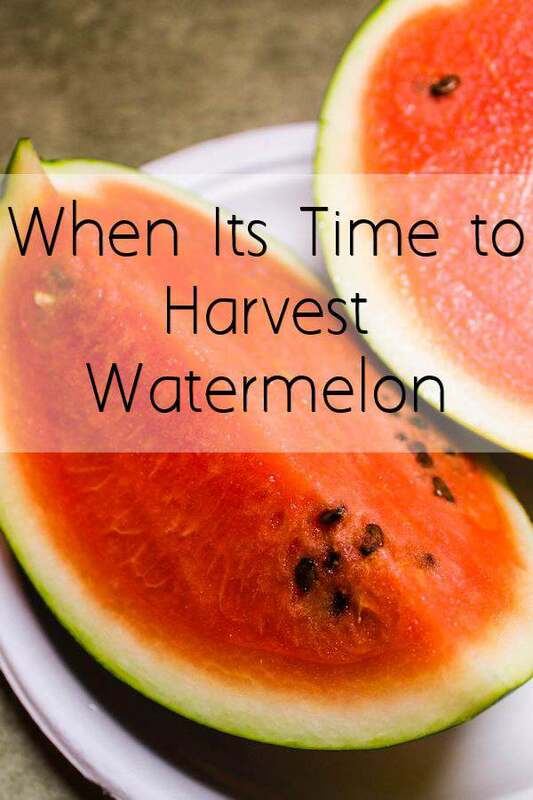 Have you grown watermelons in your garden? I have never tried watermelon in my garden, just tomatoes. They are so easy to grow and don’t seem to be a disease prone fruit. I hope you give them a try. Great tips! Watermelons don’t do well growing by me, but I’m glad yours did well! Maybe its the variety you use. I was so shocked to see how well they did this year, compared to other things in my garden that usually do well, where watermelon doesn’t. Thanks for stopping by. I’ve loved reading about your gardening adventure this year, Tammy. Watermelon is one of my favorites. I really want to try to grow some next year. I pinned this and your April Garden Update to remind me to start thinking about my first gardening attempt next year. I even put it in my calendar for April 1st to get started. I’m in Kentucky so I may need to adjust the timing some. Thanks for your tips! I’m in an HOA governed community as well, so I’m hoping to do something very similar to what you did this year. thanks for those tips. Some day I’d like to have a garden when we move out of the desert. These are great tips! Thanks for sharing Tammy!